Start’em: David Garrard vs. HOU – The Jaguars’ David Garrard has been either red-hot or ice-cold all year. Of his seven starts, he has recorded at least three touchdowns in four of them, and less than two touchdowns in the other three. We expect to see red-hot Garrard this weekend when he takes on the Texans and their league-worst pass defense, which has allowed an embarrassing 20 passing touchdowns against through eight games. Sit’em: Brett Favre vs. CHI – Favre is coming off a strong performance that saw him throw two touchdowns, including one late, in a big comeback performance against the Arizona Cardinals last weekend, but he still has only 9 touchdowns to 13 interceptions on the season. Look for him to return to his struggling ways on Sunday when he takes on a Bears defense that has allowed only 5 touchdowns through the air and has recorded 11 interceptions in eight games. Start’em: Thomas Jones vs. DEN – Facing off against the Denver Broncos, both Jamaal Charles and Thomas Jones are great fantasy options. Both should get their fair share of carries against a Broncos defense that has allowed a league-high 14 rushing touchdowns against. 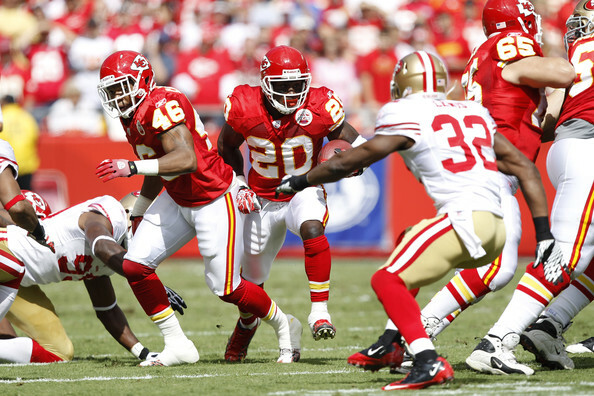 Look for both Chiefs backs to have a big game on the ground. Sit’em: LaDainian Tomlinson vs. CLE – Tomlinson has been putting together a strong season for himself, but it is beginning to seem like his 31-year-old legs are once again catching up with him as he has recorded only 164 rushing yards and a disappointing 3.5 yards per carry in his last three games. Look for him to continue to struggle this weekend when his Jets take on a Browns defense that has allowed only one rushing touchdown against all season. It can be tough to bench L.T., but if you have a better option on your bench, you may be better off using it. Start’em: Steve Smith vs. DAL – The Dallas Cowboys have struggled to defend the pass in recent weeks, allowing a total of 11 touchdowns to Eli Manning, David Garrard and Aaron Rodgers in their last three games. Their struggles should continue this weekend when they travel to New York to take on the Giants once again, and next to Eli, the biggest beneficiary of their visit should be Steve Smith. The Giants’ Smith loves playing the Cowboys, as he has recorded 345 yards and two touchdowns in his last three games against them, including 101 yards and a touchdown in their week 7 meeting. Sit’em: Chad Ochocinco vs. IND – We had Ochocinco in this position last week and we will place him here once again. While T.O. has enjoyed a great season, Chad has struggled to fight through double teams and his frustrations have grown as a result. Now he will take on a Colts defense that has allowed only nine passing touchdowns through eight games. Until Ochocinco improves upon his disappointing two-touchdown total, we advise you leave him on your bench. Start’em: Brandon Pettigrew vs. BUF – Pettigrew is quietly on pace to put up an impressive 76 receptions for 724 yards and six touchdowns this season. This weekend he will be up against a Bills defense that has allowed more fantasy points to tight ends than any other team in the NFL. If you have him on your bench, this is the week to get him into your starting line-up. Sit’em: Visanthe Shiancoe vs. CHI – Shiancoe appeared to be back to his 2009 form last week when he recorded four receptions for 66 yards, including a crucial touchdown with less than two-minutes remaining to send the game into overtime. However, he will be in tough this weekend when his Vikings take on the Bears, who have allowed only five passing touchdowns all season, and zero to tight ends. Start’em: Lawrence Tynes vs. DAL – The Giants offense should be able to move the ball at will against a poor Dallas defense, and while we expect Tynes to be kicking mostly extra points, don’t be surprised to see their offense slow down later on in the game and settle for a few field goals. Sit’em: Robbie Gould vs. CHI – Jay Cutler and Matt Forte should be in tough against the Vikings defense. Don’t expect to see the Bears offense produce much this weekend, and that doesn’t bode well for their kicker, Robbie Gould. Start’em: Giants vs. DAL – In his two starts, Jon Kitna has thrown six interceptions. Look for the Giants front four to put the pressure on him all game as they should rack up numerous turnovers against their division rivals. Sit’em: Ravens vs. ATL – Matt Ryan has thrown only five interceptions all season and his been sacked just 13 times. Don’t expect the Ravens defense to put up much of a stat line on Thursday night in the Georgia Dome, where the Falcons have been incredibly tough on opposing teams.